Pascale’s first collection uses startling imagery to journey through Venezuelan Amazon rainforests and the icy realms of Tibet. Transforming memories of childhood and marriage, she encounters a man changed into a butterfly, a bride who is a frozen waterfall. At the core of this book are two prize-winning longer poems: Eisriesenwelt, the ice mother, and Kanaima, the forest father – parents recreated as geology and Amerindian demons, in a landscape of orchids, jaguars, and talking waterfalls. and a flask from the Mnemosyne. I will sip from each. This will feel like swallowing shafts of sunlight. I’ll take deep breaths, hungry for canyon air. for the ride in the luminous lift. Then I’ll say everything I always wanted to say to her. Her hands will shake but that won’t stop me. some so musty you are invisible. in a patchwork of petals or butterfly scales. crawl slowly backwards through time. through cracks crooked as lightning. like landmarks, scars between the years. like an X-ray of a lung. with its crown in the house of thunder. drink the mirrored clouds from the rivers. like soft dust from the stars. as if a cloud-snake had fallen from heaven. Petit, born in France and raised in Britain (where she now resides), makes good use of the overtones of geography in her work, which ranges widely from France to Venezuela to Californian locale and tends to fix its perceptions upon particular places rather than actions or objects. This is not travel verse per se, but it does display an air of expectant surprise that is frequently the mark of the explorer, especially in ‘Kanaima’, a long poem that portrays a visit to southeastern Venezuela almost as a dream sequence or a hallucination (Marooned on the sky-island of my bed / I called to the past and future / for a strong young guide). 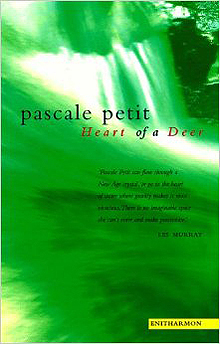 The history that haunts Petit’s verse is not the history of specific events so much as of specific places, the genii loci the author can sense but doesn’t understand or feel entirely comfortable with. The ice caves of Eisriesenwelt, in the Austrian Alps, come to stand as a reminder of this unease in the poem ‘Eisriesenwelt’ (When I left home / I sculpted my parents in ice / but they kept melting), which is also informed by the author’s visual sense and experience as a sculptor. The longing for a rooted, organic life runs through nearly all the works like the cord of a necklace (What she wanted was to return / to the original rainforest) and imparts a fine melancholy sense to the volume. — Copyright ©1999, Kirkus Associates, LP. All rights reserved.